The Hydrostatics Pressure is either utilized in the working of a Hydraulic Structure, or a Structure is checked to withstand the Hydrostatic Pressure exerted on it. Hence the study of Hydrostatics is more important in engineering. In this post, I will cover practical applications of Hydrostatics on the following Structures. 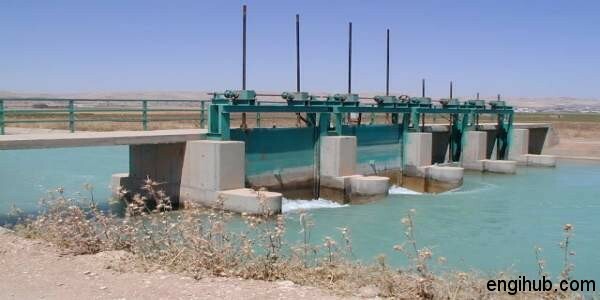 To regulate the flow of Water, in the path of a River, a Sluice Gate is provided. Hence the Sluice Gate is made to move up and down with the help of Rollers fixed on Skin Plate, which travels on Vertical Rails called Guide. These Rails are fixed on Piers or Vertical Walls. In between these two Skin Plates, a number of I-beams are provided horizontally to withstand the Water Pressure. The spacing between the I-beam is lesser at the bottom than that at top of Sluice Gate, as the Water Pressure varies in the depth. The Water Level on both sides of the Dam will be different. If it is desired to have Boating in such river, the Chamber, known as Lock, is constructed between these two different Water Levels. Two sets of Lock Gates are provided in order to transfer a Boat from Higher Water Level to Lower Water Level. The Upstream gates are opened, and the Water Level in the Chamber is risen up to the Upstream Water level. The Boat is then shifted in the chamber, then Upstream Gates are closed and Downstream Gates are opened and the Water Level in the Chamber is lowered to the Downstream Water level. The procedure is reversed for the transfer of Boat from Downstream to Upstream. When Water on one side of Masonry Walls, the Pressure will act perpendicular to the Wall. A little consideration will show, that the intensity of Pressure at Water Level will be Zero and will be increased by a Straight Line Law to wH at the bottom. Thus the Pressure of the Water on a Vertical Wall will act through a point at a distance H/3 from the bottom, where H is the depth of Water. 01) The Resultant must pass within the base to safeguard Dam against Overturning. 02) The Resultant must pass through the middle third of the base, to avoid tension at the base. 03) To prevent sliding, the maximum Frictional Force should be more than the Horizontal Force. 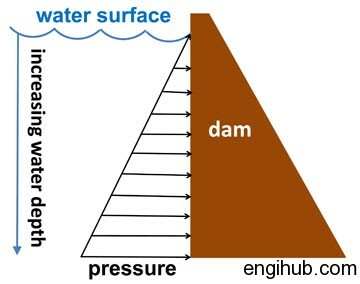 04) The Maximum Stress developed at the bottom of the Dam should be within the permissible Stress of the site.